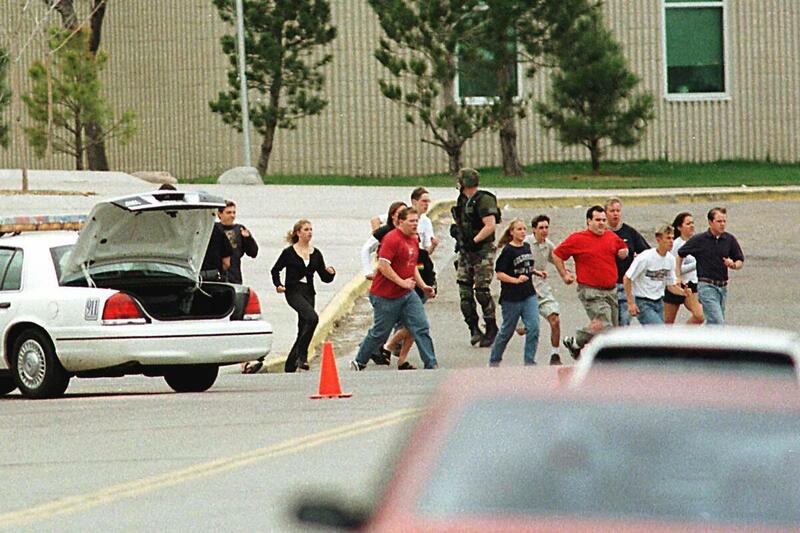 April Is A Cruel Month For This Columbine Teacher And Survivor Paula Reed remembers walking out into the sunshine of a beautiful day when kids ran by yelling, "They've got guns." Columbine High School teacher Paula Reed is overcome with grief after signing Rachel Scott's casket during funeral services on April 24, 1999. April is a hard month for Paula Reed — even though it has been 19 years. April 20 is the anniversary of the Columbine massacre. 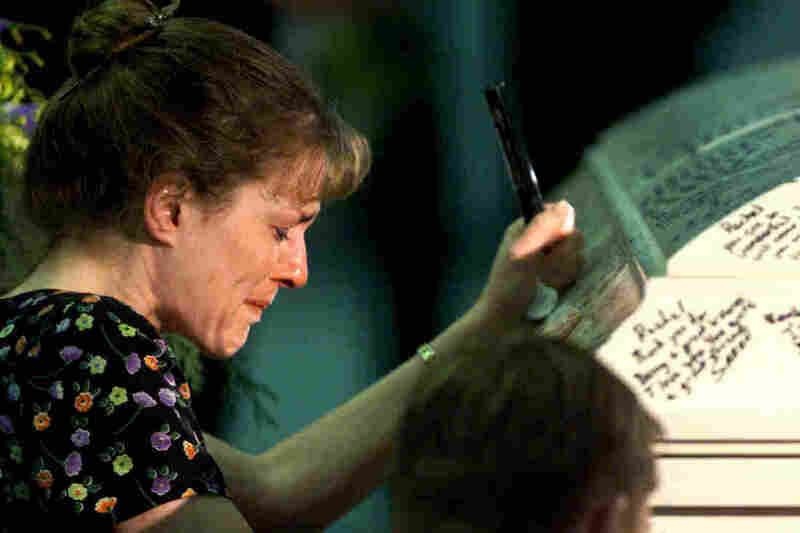 That day in 1999, two Littleton, Colo., high school students killed 12 students and one teacher before killing themselves. Reed was a teacher at Columbine High School school that day, and still is today. This week, she spoke to NPR from the same classroom she was teaching in before everything happened. On April 20, 1999, she evacuated with her students as the fire alarm went off, a "Pavlovian" response, she says, to what they thought was a drill or a student playing a prank. Reed remembers walking out into the sunshine of a beautiful day when kids ran by yelling, "They've got guns, they've got guns!" She didn't believe the claims at first because it was Littleton, and "that's just not a thing that happens." But then came the explosions — the shooters set off explosive devices, too — and urgent calls by school administrators to get students over the chain link fence that surrounded the school back then. As they heaved students over, Reed recalls, the base of the fence became littered with backpacks, high heels of teenage girls and other stuff students ditched to make it easier to climb over. After hiding in the school parking lot, Reed made it to the community library with another teacher and a group of students. She helped kids call their parents and coordinated taking roll while they waited for information. It seemed like they only waited at the library for 20 minutes, she says. She later found out it had been two hours, and that her school had been on the news the whole time. Students run from Columbine High School on April 20, 1999. She finally left the library and took a bus over to a local elementary school where others waited. When she got off the bus, she learned that 17-year-old Rachel Scott was dead and that Daniel Mauser, 15, was still missing. She coached both students on the forensics debate team. Mauser was later confirmed as one of the victims. Reed asked Ron Mitchell, a former principal at Columbine, about her colleague Dave Sanders. She'd heard he'd been shot. Mitchell told her Sanders was still in the school and that there wasn't any reason to get him out right then. She knew what that meant. When Reed finally got home that night, she watched the news until 2 a.m. She learned the names of the shooters: 17-year-old Dylan Klebold and 18-year-old Eric Harris. She'd taught Klebold his sophomore year. She says she hasn't watched the news since. "The last time I watched television news was the night of the shooting," she says. Consequently, she didn't see much television coverage of the school shooting in February of this year, when a gunman — 19-year-old Nikolas Cruz has been charged in that case — killed 17 people with a military-style firearm at Marjory Stoneman Douglas High School in Parkland, Fla. Still, the tragedy triggered her. "I came completely freakin' unhinged," she says. "It was too close to ours." Reed still teaches at Columbine High School. She has taught there now for 32 years. The day after the Parkland shooting, she didn't go in to school. "I always tell people that April is a hard month for me," she says. This year, "it's been April since Feb. 14." The years after Columbine have been rough, and she says each subsequent mass shooting has affected Reed differently. She says that not every shooting triggers her. But the shooting at Sandy Hook Elementary School was hard. The Las Vegas shooting was hard, too. Reed and many of her fellow teachers committed to stay at the school the three years following the shooting because they felt it was important to see the students who were freshmen at the time of the shooting through to graduation. "It gets better because it has to"
Reed struggled especially that third year after the tragedy. She says she got hives every time she entered the building, lost some of her hair and had headaches that lasted for days. After the freshmen graduated, she took a two-year leave of absence. During that time, she says she focused on her marriage and raising her two young kids. She also wrote romance novels that had happy endings. She says she didn't know how or if she could ever get back in a classroom again. But when her friend needed help during maternity leave, she was able to work out a job sharing plan for two years. She eased back into teaching, and it got better. "Teaching is a calling for me," she says. Time and distance also help. "It gets better because it has to," she says. That's the message Reed and other Columbine teachers want to bring to survivors of mass school shootings. Six weeks after the 2012 shooting at Sandy Hook Elementary School, where 20 elementary school kids and six adults were murdered, Reed and a fellow teacher went to Newtown, Conn., to meet with the surviving teachers. Reed remembers a teacher who was especially closed up. After a while, the woman screamed, "I just want my old self back!" Reed says she had to tell the woman, "I am so sorry, but that person is gone forever." But she could provide hope, too. "I swear to you there is a new you inside of you, and you cannot even see her yet," Reed says she told the woman. "But she is there, and you will like her, and it will be OK."
Reed says that Columbine teachers often reach out to schools after they hear of shootings. She says they know how important it is for someone to be there to tell survivors that they will be able to make it through the hard days — like the first day back or times they don't think they can keep living through the pain. She says school administrators from other schools don't often take them up on their offer. But the offer is always there. "We just want to come and offer hope," she says. "You're not alone. You can talk to other teachers that have been through this." Reed has stayed in touch with several of the students who lived through the shooting. And as for them, she says, "they're a mixed bag." 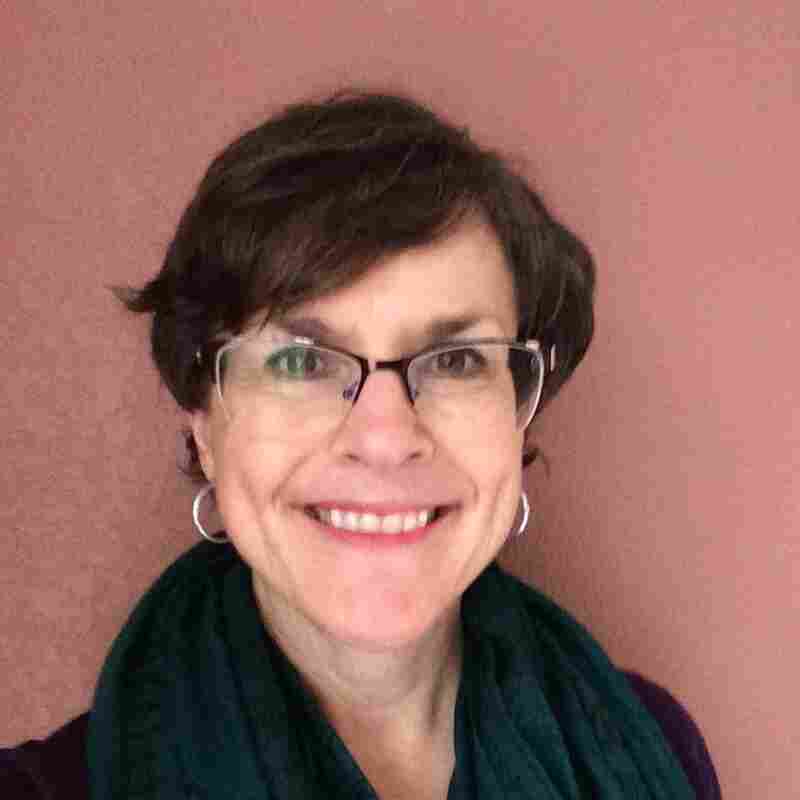 Reed has helped some of her current students organize marches and walkouts. She admires the student activism happening now, but she adds that Columbine students went to Washington right after the 1999 shooting. That summer, the Denver Post reported that at a news conference in Washington, D.C., several Colorado students called for "legislation that would require criminal background checks for all purchases at gun shows, limit handgun sales to one per month, raise the legal age for gun ownership to 21, and outlaw the sale of high-capacity ammunition magazines." The Post also reported that several news outlets were at the conference. But the students' voices didn't echo through the country back then. "There was no Facebook. There was no social media. There was no way to capture the world's attention," says Reed. These days, Reed says she tries to live by something she heard shortly after the Columbine shooting, when a Holocaust survivor spoke to her school. "Pain should never be wasted," the survivor said. A previous version of this story incorrectly stated the tenure of former Columbine principal Ron Mitchell. He held the position before the 1999 shooting.